Yo-kai are ordinarily invisible creatures, and the eponymous Yo-kai watch is needed in order to detect and reveal them. The game is often mentioned in the same breath as Pokémon and, while it’s an understandable comparison, it’s nonetheless also a rather lazy one. For example, the Pokémon games essentially treat their creatures as some kind of war-slaves, whereas Yo-kai are presented as… well, maybe not friends, but perhaps employees. Which is still several rungs up the social ladder. 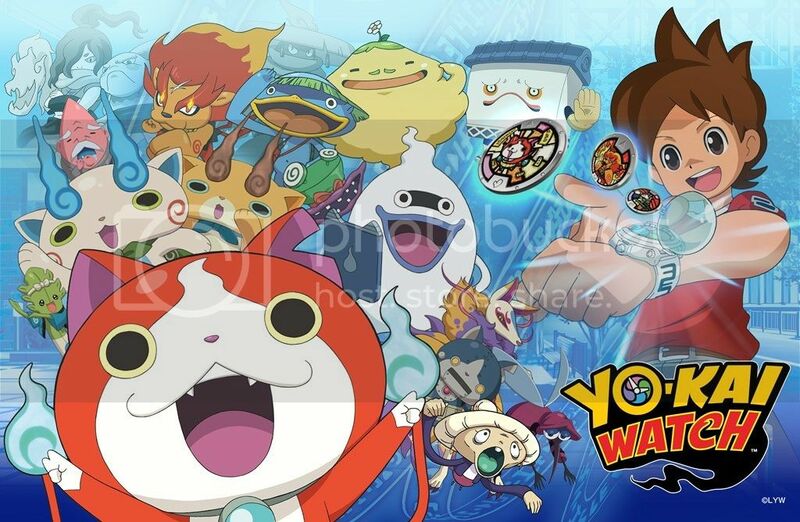 There’s plenty here to appeal to all ages but, approached purely from a children’s storytelling angle, Yo-kai Watch is fantastic in both meanings of the word. Yo-kai are everywhere, influencing the moods, thoughts, actions and urges of humans; we just can’t see them. Hungry when you really shouldn’t be? Suddenly forgotten what you were doing? Uncharacteristically greedy or selfish? That may well be the sign of a Yo-kai latching on to you. In this way, the story dictates gameplay. The main quest will shuttle you around town investigating a sort of disturbance in the Yo-kai force, uncovering hidden Yo-kai in your attempt to understand just what’s going on. Optional quests will usually involve unearthing one of these creatures who’s having an undesirable influence on somebody or otherwise causing mischief, then pummelling their little faces in until they stop. Then on top of that you can use the watch to reveal and battle Yo-kai sprinkled all over town be that under cars, in tree branches, or simply hanging around on street corners. Defeat a Yo-kai and there’s a chance that they’ll befriend you (possibly through fear, or some sort of Stockholm Syndrome). We tried to write a caption explaining exactly what you’re seeing here, but then we realised we’re not even sure ourselves. Unlike Pokémon, you’re not able to attempt to capture a weakened or fallen foe. You’ll be handed a small selection of Yo-kai as you progress through the story, and some side quests will reward you with a new friend too. Apart from a vending machine that has a small chance of gifting you a new buddy (operated either with Play Coins, or with special coins found through play), that’s it for the simple options. Defeated Yo-kai will sometimes approach you and offer to be friends and, if you accept, they’ll be added to your motley crew. This is very rare if you don’t try to help things along, though. In a rather odd move, you can feed healing items to your enemies during a battle in order to make them like you, and therefore more likely to offer friendship at the end of the fight. More expensive items theoretically have a greater influence, yet each Yo-kai has particular likes and dislikes, too. Mastering this influence system takes as much work as anything else in the game. 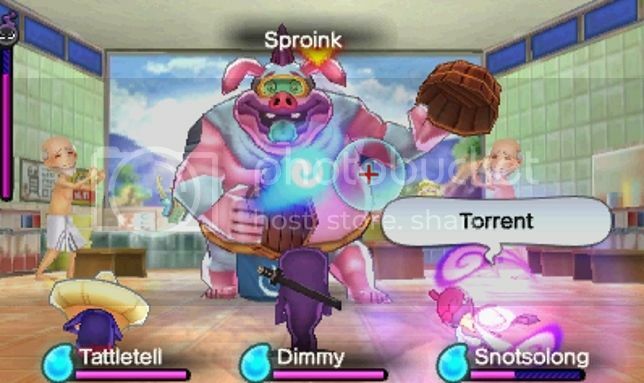 Yo-kai are, of course, used for fights. You’re able to have a maximum of six with you at once, with only three fighting at any one time; which three are chosen by revolving a selection wheel on the touchscreen. As for the actual fighting, well, things there are a little… odd. It’s certainly unique. Think of yourself not as a a puppeteer, but more as a manager. Your Yo-kai will act entirely independently. You have no influence at all over when they attack, guard, or use their special ability to ‘inspirit’ (buff or debuff) enemies or allies. Sometimes they’ll even ‘loaf’, refusing to do anything at all. You can specify an enemy or weak point to concentrate attacks on, but that’s the extent of your agency in regular attacks. What they won’t do at all without your nudge is use their super-special ability which requires their Spirit gauge to be full. When they’re ready you can tap the one you want to urge into action and, via a touchscreen minigame (spinning a disc, popping bubbles, or tracing lines), charge them up ready to go. During charging (which lasts a few seconds beyond completion of the minigame) the Yo-Kai is essentially frozen, unable to attack or guard but still able to take damage. You won’t be able to heal or switch anybody either, meaning you need to be careful about when you use these abilities. You’re in effect babysitting until the fight is over, but this is much more fun and tactical than it sounds. Add to the mix that debuffs are removed via minigames, and that you’re unable to simply spam healing items as there’s a significant gap between each allowed use, and some fights can become quite tense even though you’re theoretically not playing an active role. It’s a refreshing experience with some great humour in there, but Yo-Kai Watch is held back from the true greatness it could have achieved. The main problem it has is a teeth-grindingly terrible understanding of where the line between ‘exploration’ and ‘frustration’ is drawn. Several times during the main quest, you’ll be given only a vague indication of where to go next. The bog-standard game map is no help at all in these instances, and we’ve no shame in saying that we had to repeatedly dive into Google to locate easily-missed alleyways and nondescript entrances. We also can’t help but feel that combat relies a little too heavily on healing items for boss fights, which can be wars of attrition against enormous health bars. 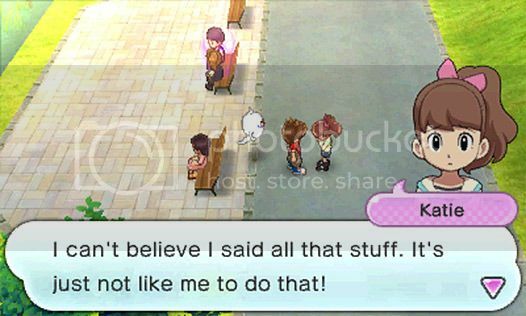 Despite the gripes we had a lot of fun with Yo-Kai Watch, and you get a decent amount of game for your money. You can run straight through the main quest in 12-14 hours if you want, but there are stacks of optional quests and hidden items everywhere. Beating the final boss not only makes new items available for purchase, but also opens up a new storyline to explore. Then, of course, there are all those Yo-Kai to kidnap/befriend. We’re so far behind that Japan is seeing Yo-Kai Watch 3 this year; after playing the first game, we’re eager to catch up. Just don’t make us wander around aimlessly anymore.